It’s a scary statistic if you happen to have a child who suffers from a food allergy: experts say that the largest proportion of deaths resulting from food allergies happen as a result of eating out. 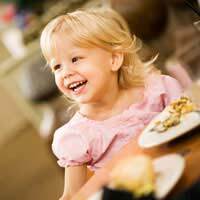 So does that mean you have to give up on eating out if your child has a food allergy? If your child has a food allergy it means that his immune system over-reacts to one or more particular foods (allergens) and treats them as enemies. The immune system will produce antibodies that can cause swelling, vomiting, rashes and other symptoms. Breathing may be affected and, in extreme cases, anaphylaxis occurs. Then medical attention is urgently required. You can keep your child safe at home by paying careful attention to his/her diet but if eating out isn't to be a bit of a nightmare, it will require a certain amount of planning. According to the Food Standards Agency about ten people a year will die as a result of an extreme allergic reaction and most of these reactions are caused by eating out in a restaurant or from a takeaway. Caterers are still not allergy-conscious enough even though one in a hundred people will be a sufferer. For those with severe allergies or coeliac disease, even a tiny amount of the allergen can cause a reaction, which in the worst cases can be fatal. Before you visit a restaurant, phone them and explain your child’s allergy. Ask if you can be catered for. If the person answering the phone is unsure, ask him to check with the chef. Or ask to speak to the chef yourself. If you can, view the menu beforehand and help your child decide what to order. Ask the chef about those particular dishes and their ingredients. Enquire about even the smallest ingredient that the chef might not think of. If the chef or the person answering the phone is unhelpful, don’t bother going to the restaurant! If you’re not able to check beforehand, you need to be very allergy-aware when you get to the restaurant. Study the menu and don’t be afraid to ask questions. Start by asking the waiter. Unfortunately staff in eateries often don’t have appropriate allergy awareness training, so ask to speak to the chef, or even the manager, if you’re not satisfied with the answers. The Food Standards Agency has produced an allergy chef card. Carry copies of these with you listing foods or products to which your child is allergic, and hand one to the waiter or chef, stressing the importance of avoiding these allergens. You can download the card from the Food Standards Agency website. Teach your child to carry a card with them at all times and to show it to anyone who is preparing food for them children and young people who are most often at risk because they aren’t aware of the severity of their allergy. Ask what oil has been used for cooking or in salad dressings. Peanut is a favourite especially in Chinese restaurants while Indian restaurants often use ground nuts or nut flour to thicken curry sauces. There can be nuts in desserts, either as decoration or in the pastry or cake base. It might only be a trace of nut but it can be enough to set off an allergic reaction. So watch out for the hidden ingredients. You might think that if you stick to self service, help your child to choose carefully and serve her yourself she’ll be safe but … there’s no guarantee that the serving spoon lying innocently in the simple bowl of tomatoes wasn’t just used for the nut-oil-dressed salad. Or that there hasn’t been contamination between the dishes. So self service is best avoided. Make sure your child always carries any medication the doctor has prescribed with them and that they know what to do with it. If they are eating out with friends, make sure they know what to do if he’s unable to do it himself. Or if he’s younger, and with a friend’s family, tell the adults. And remind everybody to call an ambulance if they have any trouble at all breathing.